Showing 23 articles from February 17, 2013. Clam digs ready to go Sat., Sun. It’s time to get back into the swing of things with clam digging. The Washington state fishery managers have approved an evening razor clam dig for this Saturday and Sunday at Twin Harbors and Long Beach. Caleb Doyle is still listed in serious condition at Harborview Medical Center in Seattle according to a spokesperson Monday afternoon. Doyle, who was life-flighted to Harborview last Wednesday after suffering third degree burns to the upper part of his body, is still in the Intensive Care Unit. Raymond Police arrested Mattias Joshua Ganino, 30, of Raymond for child molestation in the first degree. Ganino was arrested Sunday night and booked into Pacific County Jail. The Raymond Lady Seagulls are the only local team of five competing at District to qualify to the Class 2B Regionals. Raymond earned a spot by taking out Wahkiakum 54-51 in a loser-out game last Thursday at Rochester. State Champion!! Photo by Julie Crews Raymond’s Hunter Border won a state title at 182 pounds at the Class B State Mat Classic Saturday. Raymond’s Matthew Boyes placed third at 195 pounds. Winners of the Ninth Annual Plomondon Independent Film Festival took home the coveted PIFFY Award Saturday night at the Morgan Arts Center. Selected by audience members, winners came from all over the area and competed in several different categories. Toledo High School’s Two Hands on the Wheel program is vying for a grand prize of $15,000 after entering the Toyota Teen Driving Video Challenge last week. While students have been working since December to educate others about the dangers of distracted driving, they submitted their entry to the contest Feb. 13 for a chance to win one of several cash prizes and access to a Discover Channel film crew to create a professional-grade video for driver safety. The Valentine’s Prime Rib dinner at the Café was a sell-out. My apologies to anyone thinking they could still get a reservation when they read about it last week. The building has a maximum capacity set by the Health Department but sometimes they can do take-outs. This Friday night’s dinner is Brown-Sugar Meatloaf with all the trimmings. This is an all-time favorite meal, so call Linda quickly: 295-0875. Tuesday’s Sr. Nutrition Lunch will feature Chicken Chow Mein as the main dish. Call Jan at 295-0597 by Monday evening to make reservation. The First Salmon Ceremony is a sacred event. The tribal fishermen always knew when it was time for the salmon to return. All fishing stopped as soon as the first salmon was caught, and immediate preparations were made on shore for its reception. Not until these preparations were complete could that salmon be brought ashore. All the sick people must be removed from the village, as were pregnant women and those women and girls who were in their regular monthly time. All dead bodies of people and animals must be removed from the village. It was a must for the village to go through a thorough house-cleaning. Town Hall Meeting 6 p.m. Tuesday, due to the Presidents Day holiday. Vision:Toledo’s Arts, Recreation and Entertainment Meeting 6:30 p.m. at the MAC Tuesday. Contact Mike, mike@morganartscentre.com or (360) 864-4ART. Another reminder to be good neighbors - If you see or hear something suspicious at your neighbors, please call them to make all is well, report it if necessary. Be cautious, be safe. Tickets are still being sold for the Lions Club annual Crab Feed - less than two weeks to purchase tickets! Call Carol Broom at 295-3801. First off, I would like to ask for help on behalf of Fire Commissioner Randy Pennington of the Lewis County Fire District 15. As we all remember with horror, on Dec. 14 20-year-old Adam Lanza fatally shot twenty children as well as six adult staff members at Sandy Hook Elementary School in Newtown, Conn. Pennington would like to present Medals of Honor to the families of the teachers who died defending students. To raise funds, they will be holding a fill-the-boot in addition to a full Spaghetti dinner at the Winlock Community Building next to the fire department this Saturdayfrom 4 to 8 p.m. They are currently accepting donations for a silent auction, which is to be held at the same time. We would like to thank the businesses who supported the Winlock Backpack Program following Make a Difference Day. Additional monies were collected in donation cans at Winlock Auto Parts, Yours, Mine and Ours Salon, Guadalajara, the Club, the Fire House, and the Handy Store. Additional food was collected by MacKenzies's Salon, Timberland Bank, and All About Accounting. The support by these businesses and the community has been truly amazing! Lewis County Commissioners approved a $173,000 request from Valley View Health Center to create a proposed mental health treatment program available to all residents during their meeting Feb. 11. Coming from a fund set up after the passage of a 0.1% sales tax increase in June of 2011, the $170,000 was needed to apply for a matching Social Innovation grant from the John A. Hartford Foundation, for which Valley View was able to apply by the Feb. 18 deadline. Myranda Curtis canned the winning shot and fired in 23 points to keep South Bend alive at the District IV Girls’ Basketball Tournament last Tuesday night (Feb. 12) at Montesano. South Bend closed out its season with a 70-52 loss at Naselle January 29. Justin Elliott poured in 23 points and took down 11 rebounds. Willapa Valley’s basketball season came to a sudden stop at the hands of Toutle Lake 67-40 at the District IV Girls’ Basketball Tournament last Tuesday (Feb. 12) at Montesano. Karli Friese scored 15 points for Valley. The Castle Rock girls basketball team has finished off a perfect season at 23-0 with a District IV Tournament Championship after defeating Montesano Saturday. The Lady Rockets will advance to the WIAA state regionlas after their 43-32 victory over the Lady Bulldogs. Castle Rock will play King’s or Blaine in a regional playoff at 8 p.m. Friday at W.F. West for a trip to the state quarterfinals in Yakima. Levi Godinho pinned his opponent with seven seconds to go to win the state 1A wrestling title in the 160 pound weight class at the WIAA Mat Classic at the Tacoma Dome. 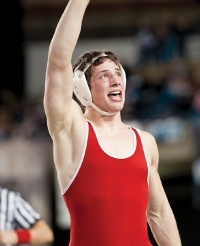 This was the first individual title for the Castle Rock Senior. He placed second as a junior. Pacer Said earned the silver medal in the 152 weight class. As a team, Castle Rock finished third with 101 points. Toledo's 60-49 victory over Kalama for the District IV1A Championship Friday was straight off the clipboard of Head Coach Scott Merzioan. Start fast and keep the pressure on. It was with that recipe the Indians took home their first District Title since 2007 despite tremendous success during through the last six years. Rachel Archer and Marco Bautista won individual wrestling titles in the WIAA Mat Classic at the Tacoma Dome on Friday and Saturday. This was Archer's third state title and in her first two rounds wrestled only 76 seconds, resulting in two pins. In the semi-final match against Cynthia Rameriz of Quincy, Archer was able to pin her after a little more than three minutes of wrestling. She finally defeated Kassi Strano of Battleground 15-0 in the final. After two stunning upsets, reality finally caught up with the Winlock boys in the District IV 2B Basketball Tournament on Friday and Saturday night. Friday night, the Cards took a 54-37 loss to the number one-seeded Moron/White Pass Timberwolves. Inside muscleman Michael Blum led the team with 11 points and six rebounds. Caleb Rose added 8 points for the Cardinals. Lewis County Fire District 2 celebrated the outstanding achievements of firefighters and EMS staff during their annual awards dinner Saturday night.